Instead of ‘have’ Spanish speakers use ‘to take’ when referring to ‘having food/drink’. For example, ‘Tomo un café cada mañana pero no tomo tostadas’ – I have a coffee every morning but I don’t have toast. ‘Intenta persuadirles para que podamos tomar prestado su coche’ – try to pursade them to lend us the car. Tomar una decisión – to take a decisión. Tomar el pelo – to kid someone. Tomar como tu marido / tu esposa – to take as your husband / wife. Dar means ‘to give’ (though not to give a present, this is ‘regalar’). However, it also has many other meanings which we will go into below. una torta – a slap. un puñetazo – a punch. una patada – a kick. caña – to put someone in a difficult situation. la espalda – to turn one’s back. un abrazo – to embrace, to hug. a luz – to give birth. la mano – to shake hands. Darle rabia – to make a person angry. ‘Las colas largas me dan rabia’ – long queues make me angry. Darle vergüenza – to make a person embaressed/ashamed. ‘La basura en la calle le da mucha vergüenza’ – Rubbish in the streets makes him very ashamed. Darle pena – to make a person pity/upset. ‘Le da pena cuando su hijo no saca buenas notas’ – it upsets her when her son doesn’t get good marks. Darle risa – to make a person laugh. Darle mierdo – to make a person scared. Darle susto – to give a person a sudden fright. Darle asco – to disgust someone (make someone disgusted). Darle sueño – to make a person sleepy. Darle estrés – to make a person stressed. Darle calor/frío – to make a person hot or cold. Darle hambre/sed – to make a person hungry or thirsty. Darle ganas de hacer algo – to make a person want to do something. ‘No me he dado cuenta de que el escalón estaba allí’ – I didn’t realise that the step was there. And ‘dar la vuelta’ means ‘to turn around’. ‘Da la vuelta enel semáforo’ – turn around at the traffic light. ‘El reloj acaba de dar las cinco’ – The clock has just struck five. ‘Dar’, when applied to trees and fruits, means ‘produce’ or ‘bear’. ‘Los perales dan peras’ – The pear trees produce pears. ‘Él está dando clase’ – He is teaching. ‘Me da igual no haber sacado un ocho en el examen’ – I don’t care that I didn’t get an eight in my test. ‘Dale que te pego’ means to keep insisting in something, to show that somebody is stubborn. ‘No dejaba de repetir lo mismo, dale que te pego’ – He just kept saying the same, non-stop. The reflexive verb ‘parecerse’ means ‘to seem like’ or ‘to look like’. You use it when you want to make comparisons between two people. ‘¿A quién te pareces en tu familia?’ – who do you look like in your family? ‘Pues, me parezco a mi madre de aspecto y mi padre en personalidad’ – well I look like my mother but I am like my father. If you wish to comment on someone’s mood or appearance that day then use you use parecer + adjective. ‘Parecen estresados hoy’ – they look stressed today. ‘Pareces enfadado conmigo’ – you seem angry with me. ‘Me parece que trabaja bien’ –….it seems to me that he does good work. ‘pero no parece que le guste…’ – but it doesn’t seem to me that he likes it. ‘¿Qué te parece el partido?’ – What do you think about the match? (Or literally, how does the match seem to you? ¿Qué le parece la casa a tu madre? – What does your mother think of the house? Examples: ‘Al parecer está sola en casa’ – Apparently she is alone at home. 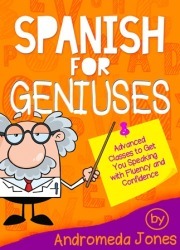 Examples: ‘No me parece bien que no vaya a clase’ – It doesn’t seems right to me that he skips class. Examples: ‘Me parece mal que mal que el perro esté siempre fuera’ – It seems wrong to me that the dog is always outside. 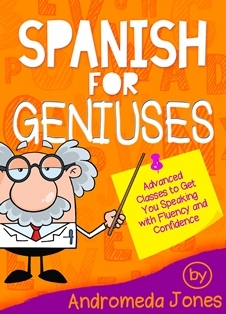 For detailed explanations on all Spanish grammar, including verb tenses, nouns, adjectives, adverbs, pronouns, participles and the subjunctive, translation lists and a comprehensive ‘How do you say?’ section covering phrases to use in all types of conversations, buy our 5-star rated book, Spanish for Geniuses: Grammar and vocabulary to get you speaking with fluency and confidence. Discover a book that cuts through the jargon and gives you the phrases you need to speak with confidence.